It is with mixed emotions and concern that this last review of my father, legendary comedian Pat Cooper is posted. It is posted now in his final days of his life and not from a need to prove or defend the truth, but rather as an obligation to heighten the awareness of those readers and his fans that may innocently be unaware of his sixty-year vendetta with his biological family and now his very apparent mental and physical illness. For many years my father Pat Cooper has used his biological family as a source of material for his act. It publicly became acceptable for him in this context to embellish the truth as a source of entertainment for his audience. Nobody in our family ever found anything wrong with that, actually we were all quite amused and happy for his success. For me, I felt extra special and loved hearing him talk about me in his shows and on all his albums. However, when my father decided to write a memoir or a book about his life, How Dare You Say How Dare Me! - it was supposed to be an accurate account of all of his past life experiences and even some present ones. It is necessary that readers be made aware that throughout his book, the author Pat Cooper, presents many misconceptions with respect to his earlier biological family relationships and experiences. As one who lived through many of those experiences, I would have to say that my father’s book presents to the readers and his fans with a perspective that is very much far from the truth. Somehow in his memoir my father has chosen to eliminate some very significant events. That material should have been inputted in his book in order for the reader to see what truly makes him tick, and he should have added the "hows and whys” he became famous and ultimately known as the angry comedian. The authors use of sensationalism throughout the book is used as a tool to entice the reader’s interest and curiosity. Perhaps the authors misinterpreted my father’s words (as they were told to his two co-authors) and would like to add or should have added some of the information in the following paragraphs below as an epilogue to insure the memoir was presented with more accuracy and completion. It was truly an unfortunate experience that both my biological sister and I lived through. The impact of the experience has affected both of our lives in different ways. Sometimes the true reason as to why things happen is clouded by what we imagine they could have been if our father had stayed around. My sister and I have come to the realization that it would be impossible to try to rationalize the cowardice actions of any man, any parent, under any circumstances, who could turn away from their two biological children, adopt another baby, and walk away from their biological children like they never existed. I have learned that it was necessary to alter expectations in order to truly accept and understand the emotional limitations and hypocritical actions of this man. Nevertheless, it was a long and a very painful period for both of us. In the words of Martin Luther King: “The ultimate measure of a man is not where he stands in moments of comfort, but where he stands at times of challenge and controversy.” Through the years, my father has consistently demonstrated that for whatever reason, he was only capable of achieving the emotional ability to stand as a dark shadow in our lives. I have always been hurt by that fact, yet sadly comforted in a sense to have come to accept that to have a father who was filled with such anger and negative energy present in my life, that it would have been much more toxic to have him remain around in our lives. It is ironic that through it all, the entire one thing that we both learned from an absent father and a very present and loving mother, and grandmother, (his mother), was the true blessings of a loving family. It is really a shame for him that he was not only unwilling to share in all our wonderful memories and accomplishments, but also missed out on all the genuine love that truly bonds our family together. These are things we will always have, as they are truths within our heart. There is nothing that can take them away, not even the deceptive words in his book and evasions of the real truth in his personal life and his stage persona. A person can only hide behind an image for so long. Eventually, in time, the truth somehow always manages to shine through. My sister sums it up best: "Thank God for my brother’s book, Dear Pat Cooper, What happened to my father Pasquale Caputo? It is the only book that has helped to show the public what really happened. I know because I am Pat Cooper’s biological daughter and I was there, too! My brother’s website, DearPatCooper.com, also shows the angry and the vindictive side of our father, humiliating my brother and the rest of our family on national television, radio, print, and all social media. This is just the tip of the iceberg that my brother and I had to deal with: a loveless father who was emotionally unavailable, heartless, verbally abusive, selfish, self-centered, egotistical, angry, bitter, spiteful, and obviously a misogynist. But through all that my brother has prevailed and managed to relentlessly express to a man his unconditional love and the need for a father’s love. His love of family, writing, and his tenacity is the ultimate proof of a son’s devotion and unconditional love for his absent father. So, to the outspoken and rude co-authors of Pat Cooper’s book and one of their very uninformed wife, the same cowardly wife who has since removed her own nasty comments about my brother on Amazon right under my brother’s personal review of our father’s book. Within forty-eight hours she immediately removed her nasty comments because of all the unexpected influx and dozens of truthful and unfavorable comments that followed her nasty words about my brother and what he should and shouldn’t be doing with regards to my father and their relationship or lack thereof. I guess she learned her lesson and quickly realized that she was the catalyst who started all the controversy under Pat Cooper’s unfavorable book reviews." So, my biological sister Louise and I want to say to anyone else who feels compelled to conjecture on what they perceive as being truth - Let us make it clear to all of you one last time! Since all of you were NOT there, are NOT related to us, have NOT walked in our shoes, you have no basis or no right to offer any opinion. Your perceptions are clearly and only based on the false image that Pat Cooper has portrayed to you through the years. Therefore, please do not be so bold and arrogant as to make suggestions as to offering this man, Pat Cooper, our father, unconditional love nor contacting me, Michael Caputo, by phone, social media, or by sending me anonymous hateful emails. Let me also add that I, Michael Caputo (Pat Cooper’s only son) received numerous calls while I was living in Miami Beach in the summer of 2014 and was told by my father’s supposed close friend that my father Pat Cooper is a generous, kind loving man, and a devout philanthropist because he had supposedly donated $100,000 to the St. Jude Children’s Hospital and Clinic. That was truly a wonderful gesture and I agreed with his friend on that one. But once again, I must add that none of you were there when my sister and I were in Family Court numerous times at five and seven years old, crying and tugging at my mother’s dress because we were there for hours with her trying to get a measly few dollars a week (child support) from Pat Cooper so she could put food on the table. Also, at that time we were living on the third floor in my grandmother’s house (Pat Cooper’s mother’s house) rent free for years already, because he refused to pay the rent and told his mother to kick us out if her rent was not being paid. So I ask you all again and reiterate, to the co-authors, their wives and the dear friends of Pat Cooper to please keep your comments, memories, and devotion for Pat Cooper to yourselves and stop trying to convince me, Pat Cooper’s son, that my father is and has been a good father. Stop telling me that I am the son and that I should be the one to reach out to him once again. I have reached out to my father my whole life and the whole purpose of my book (which was a letter to my father) was to reach out to him again. Nothing ever worked! To all of you, not related: He might be a good friend, a great comic, but certainly without a doubt has portrayed himself in all of the media, past and present, to be a very angry man who has proven himself to be an emotionally unavailable father and a vindictive son! Sadly, time has long passed and love was something Pat Cooper should have offered his biological children and family many years ago. No matter how loud he bellows trying to convince himself and the world otherwise, the truth is: He never tried to be our father! He instead substituted by adopting another child back in 1970 and harbored resentment for those who tried to help him acknowledge his responsibilities as a father to his two biological children. I guess that was easier; to be a coward and turn away. Perhaps maybe these actions were not totally generated by him but rather from the fear, possessiveness and insecurity harbored by his new hypocritical religious adulterous wife, Patti Prince. This is something I will never know, understand, nor does it have any significance in justifying any of his prior actions. But it still saddens me and now I am truly concerned about his mental health and who is really there for him now. His co-author/agent also told me that he no longer speaks to his adopted daughter and her husband anymore. Now he really has nobody, and I feel everyone in his camp, on and off his payroll are taking advantage and sabotaging him in his old age. However, there is one thing I do know and that is that I still love and care about him even though he has caused me, my sister and the rest of our family so much pain. It is so pitiful that my father has invested so much energy and time in trying to blame others and make excuses for all of his poor choices, that sadly his entire life has passed by without knowing and experiencing the love of both his beautiful biological children and family. It is incomprehensible to even begin to imagine how a son could lack compassion and refuse to reconcile with his own loving mother and father before they passed on. It is even more pitiful that his egocentrically personality has blinded him to be able to see or acknowledge that through the years it wasn’t only all about him and his feelings. He sadly doesn’t even realize that his constant “saga” of personal persecution, which he continually reveals throughout his book, consistently portrays him as an insensitive, selfish and lonely sole. It seems that Pat Cooper is always throwing a perpetual tantrum and playing ‘the victim’ about things that didn’t go his way. He appears to be a man who was never happy in either his personal or professional life. It is really quite sad that at this point in his life he still has a need to publicly justify his actions by ridiculing his family and his famous colleagues in show business on all the trash media that will have him on just to boost their ratings. Perhaps maybe he still yearns to somehow be connected to his biological family and this is unfortunately the only way he knows how. I guess it is true that “nothing is more wretched than the mind of a man conscious of guilt.” It’s quite ironic that even though he dismissed himself from any part of my sister’s life and mine, we still, in a sense, somehow feel sorry for this man. As I have said; I have learned to accept his emotional limitations, but realistically I will always be disheartened by all the anger and resentment he still possesses about two innocent children and a wonderful loving mother he never had the courage or took the time to know. I am thoroughly relieved that both my biological sister and I, Michael and Louise Caputo are void of this gene! In conclusion here are some final words for the man who fathered me, the sperm donor, as some call him, and oh yes, I must not forget to add and acknowledge the one obligation that Pat Cooper actually fulfilled and constantly reminded me of throughout the years: That he was forced to pay the meager “court ordered” child support, yes the meager “court ordered” child support for my sister and I until we both turned 21 years old. Dad, we both know that it cost you a lot more than the $90 every week you resentfully sent us for child support than it cost you to shop around, hire lawyers, adopt, and purchase another child back in 1970. I am quite sure that she cost you thousands of dollars, yet you cried to the judge that you had no money back then to pay for our medical coverage, braces for our teeth, rent to your mother for living in her house for free, Catholic school, or any of our clothes and food. Where did all the money come from to pay for that little adopted girl that you and your new wife Patti Prince purchased around that same time? For years you have made others laugh, but to those like myself who know the truth, your memoir exposes the most significant tragedy of Pasquale Caputo’s life and legacy, which is that you still have not yet been able to release all the sadness that dwells inside your own heart. You are truly incapable of love, giving it or accepting it. I truly hope that your personal torment will someday end and that you can face the truth to free yourself of all the anger and anxiety that has so totally consumed you for your entire life. It is only then that genuine love, happiness, and peace will find their way into your hardened heart. It’s not too late! You should try it! It is a wonderful feeling! We as a family have felt it for years! I also feel sad and scared for you that in the last days of your life you might die alone, exactly like your clinically depressed father did, another family member with whom you also didn’t make peace with before he died. This is the way it might end for you, too, and that is the part that most concerns me. And remember, this was your choice, and it is never too late to make amends and change your destiny. Another disturbing moment while listening to some of the audio in 2012 of you on the Opie and Anthony radio show, ranting and raving for fifty minutes with such anger, hate, and using profanity to Howard Stern and his daughter. That was when I realized and knew with certainty that something had changed in you for the worse and that something was with your mental health. I cried that day because I knew that wasn’t entertainment anymore, that was not comedy, and this wasn’t my father. I was in disbelief that your friends and agent hadn’t intervened before you would say something on that trash media show you might regret. I knew from the conversation on the show that day that that wasn’t the quick-witted talented comedian and funny man that I had remembered from years past. That just gave me another reason to reach out again and actually try and find out where your adopted family was and who really had your back. It took me almost three years to get up the nerve to come looking for you because I was sick and tired of always being rejected by you. But I swallowed my pride again and decided to go to your apartment building myself and thought I could maybe find out some of the answers to my questions. But now I sadly know you haven’t changed one bit, not even after writing a memoir that is supposed to be cathartic. And from our very last phone conversation where you stated to me that I wasn’t welcomed in or anywhere near your home, and you distinctly told me twice, to let you die in peace and die the way you chose to die, I was left speechless. I am a man of my word Dad, and I promise to respect your wishes, but I am still not comfortable leaving you in that ill state of mind that is so apparent to everyone now. The only good thing that can come out of all this is: I can finally move on with my life and your minions can never say that I didn’t try hard enough. Maybe now they will finally leave me alone, too! I still love you, Dad, and I don’t know how many times I have to say that for you to hear me. I’ve never heard you say that to me, not even once. I am still hurt by all the calls from your friends and very disgusted knowing that your son-in-law, the one that you hired and left in control of all of your social media pages (your Wikipedia page, your My Space page and your Facebook Page) has diminished them to the point of disgrace and embarrassment. 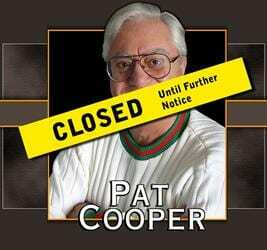 Also, to add insult to injury this son-in-law of yours has closed down your website page, PatCooper.com. The only thing that remains on your website is a picture of you with a yellow banner over your mouth stating: CLOSED until further notice. I worry and I am very concerned for your safety and well-being and I believe that your adopted daughter and her husband do not have your best interest at heart, anymore. That was another reason why I took a trip to your apartment just to see for myself what conditions you were living in. It scared me half to death and brought flashbacks and memories of your father right before he died. It was confirmed to me once again by your agent/co-author that you really did have a falling out with your adopted daughter and her husband and that you have fired Steve, your agent, and you have officially retired. I guess that your son-in-law is no longer on your payroll and the paychecks have finally stopped. Dad, the only part of your website your son-in-law has left up is this picture of you that I posted below just for you to see what he has done to your profile on-line. This behavior is utterly disgraceful to a man and a legend whose career has spanned for more than six decades. Here is a man, my father Pasquale Caputo, aka Pat Cooper, who has taken care of his adopted daughter and her husband for years and now at the end of his life, with failing physical and mental health, they are paying him back by treating him like a senile worthless old man. I forgive you Dad and remember we are blood. I am always here for you and always have been.